The HomeLink universal transmitter can be programmed to replace the hand-held controls of devices already in use. HomeLink allows you to conveniently activate garage doors, estate gates, security systems, home or office lighting and other electric devices by means of control buttons inside your car. HomeLink can replace up to three hand-held transmitters operating existing devices on your property with a single universal transmitter. This will be possible for most transmitters which control the drive units for a garage door or external gates, etc. You can programme the individual hand-held transmitters for your remote control at or near the centre of the radiator grille. This is where the control unit is located. To be able to control systems with HomeLink, you need to perform initial programming on the HomeLink transmitter first. If systems fail to respond after the initial programming, check whether these systems work with a "rolling code" (variable security code). When you are programming the HomeLink universal transmitter, make sure that no persons or objects are close to the devices receiving the transmitter signals. If a gate or door is inadvertently set into motion during programming, persons might be injured or other damage caused by moving parts. 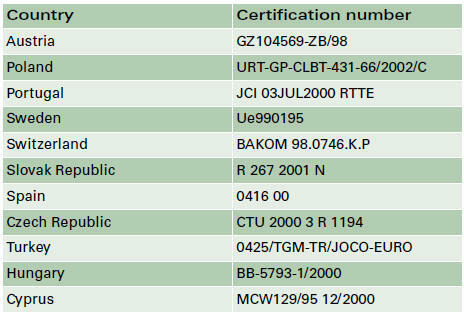 • HomeLink® is a registered trademark of Johnson Controls. 2. Press and hold down the two outer HomeLink buttons, fig. 197 until the indicator diode A, fig. 197 begins to flash after about 20 seconds. This procedure will delete the standard factory settings and does not need to be repeated when programming the other buttons. 6. 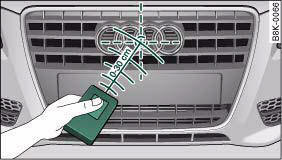 Hold the original hand-held transmitter at or near the centre of your car's radiator grille, fig. 198. 8. As you do so, watch the turn signals on your vehicle. HomeLink confirms successful programming by flashing all four turn signals three times. 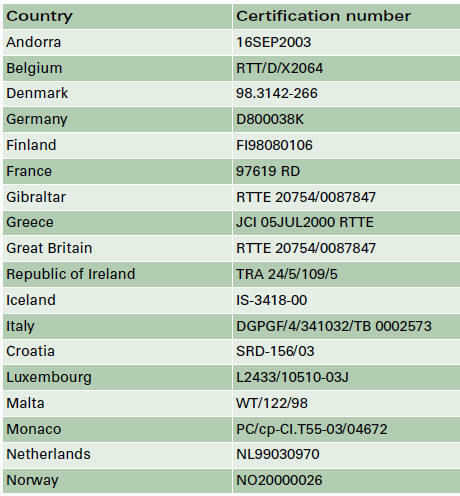 Some devices require rolling code programming of the HomeLink universal transmitter. – Press the already programmed HomeLink button again and hold it down. – Watch HomeLink diode A, fig. 197. If the diode starts flashing rapidly and turns into a constant light after about 2 seconds, this indicates that the device you wish to operate (e.g. a garage door opener) is equipped with a rolling code. – Locate the programming button on the garage door drive. The exact location and colour of the button may vary depending on the type of garage door opener. – Press the programming button on the door drive unit (this will normally cause a “programming mode indicator lamp” on the unit to light up). You now have about 30 seconds to start and complete the programming of the HomeLink control button on the operating unit. – Press and release the already programmed HomeLink button. – Press the HomeLink button again to complete rolling code programming. After programming at the operating unit in the headliner, the garage door opener should recognize the HomeLink signal and respond when the HomeLink button is pressed. Now the other control buttons can be programmed as required. • Having a second person assist you makes programming of the rolling code easier and faster. For some makes of garage door openers the HomeLink button may have to be pressed a third time to complete the training sequence. • If you encounter problems programming the rolling code you may find helpful information in the operating instructions of the garage door opener or other device you wish to operate. The programmed devices are activated by means of the HomeLink control buttons in the headliner. – Make sure that the ignition is on. – Press the programmed HomeLink button, fig. 197. The device assigned to that button (e.g. garage door) will be activated. The HomeLink indicator diode, fig. 197 will light up when you press the button. You can erase the complete HomeLink programming by pressing the two outer buttons. – Switch on the ignition (do not start the engine). – Press and hold down the two outer buttons until the indicator diode starts to flash, fig. 197. – Then release the buttons. After the programming of the HomeLink buttons has been erased, the system will return to the training mode and is ready to be reprogrammed at any time. • Programmed buttons cannot be erased individually. • For security reasons it is advisable to erase the programming of the HomeLink buttons prior to selling your vehicle. A HomeLink button can be re-programmed individually without affecting the other button allocations. – Press and hold down the selected button until the indicator diode, fig. 197 starts flashing slowly. – Hold the original hand-held transmitter for the garage door opener or other device directly in front of the radiator grille of your vehicle (at or near the centre), fig. 198. The exact distance depends on the system that you want to program. – Press the button on the original hand-held transmitter for the garage door opener or other device. – As you do so, watch the turn signals on your vehicle. HomeLink confirms successful programming by flashing all four turn signals three times. 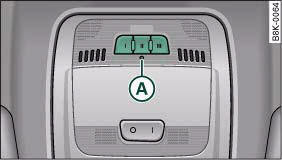 – If the turn signals fail to flash three times, repeat the procedure with the transmitter held at a different distance from the radiator grille. When the turn signals have flashed three times, this means the device previously stored in HomeLink has been erased and the new system programmed in its place. To activate the new system, press the HomeLink button that has just been re-programmed. It may require several attempts before programming is successful. When programming a new device, keep the button pressed for at least 15 seconds before trying again with the transmitter in a different position. Keep watching the turn signals during that time.